Transparency Market Research (TMR) has published a new report titled, “Erectile Dysfunction Drugs Market - Global Industry Analysis, Size, Share, Growth, Trends, and Forecast, 2018–2026”. 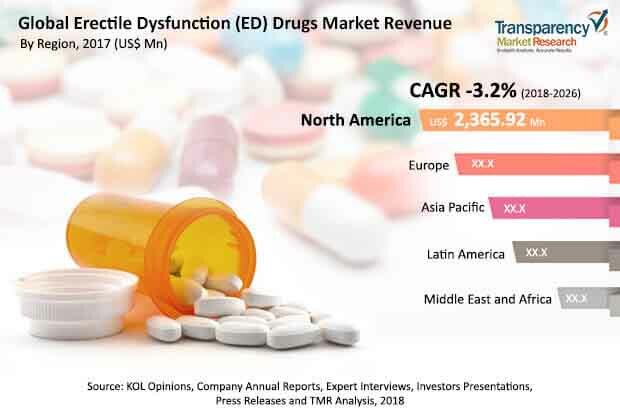 According to the report, the global erectile dysfunction drugs market was valued at US$ 4.35 Bn in 2016 and is projected to decline at a CAGR of 3.2% from 2018 to 2026. The report states that the overall market revenue is expected to decline during the forecast period, owing to loss of patent exclusivity. Bayer’s Levitra/Staxyn (vardenafil) is scheduled to expire in 2018 and is expected to contribute to the decline in revenue. However, high prevalence of erectile dysfunction, rise in geriatric population across the globe, and patient compliance are expected to boost sales in the erectile dysfunction drugs market during the forecast period from 2018 to 2026. North America held the largest share of the global erectile dysfunction drugs market in 2017. The U.S. is the largest pharmaceutical market in the world, and accounts for about 95% of the market in North America. The erectile dysfunction drugs market in the U.S. is driven by the availability of recognized branded formulations such as Viagra (sildenafil citrate), Cialis (tadalafil), and Levitra/Staxyn (vardenafil). However, the looming patent expiries of these branded drugs in the near future are expected to slightly alter this scenario by the end of the forecast period. According to research conducted in the U.S, nearly 50 million men suffer from erectile dysfunction in the U.S. The rate of erectile dysfunction has increased from 5% among men 40 years old to 15% among those 70 years old. The number is expected to rise due to increase in geriatric population and rise in incidence of diseases such as diabetes, cardiovascular diseases, and hypercholesterolemia affecting the normal erectile functioning. Eli Lilly and Company and Pfizer are the leading global players in this market, recording the highest sales for erectile dysfunction drugs with blockbuster brands Cialis and Viagra along with other players such as Bayer AG (Staxyn). Viagra is a trade name for the drug sildenafil citrate. Within the drug class of selective phosphodiesterase type 5 (PDE5) inhibitors, it is generally the first line of treatment for erectile dysfunction. Viagra is one of the most widely sold and distributed products across the world. Viagra is poised to account for the leading share of the global market during the forecast period from 2018 to 2026. In December 2017, Teva started offering wraparound services to support patients. Patients may order their medicine online and have it shipped directly to them. In terms of distribution channel, the retail pharmacies segment is projected to dominate the global erectile dysfunction drug market during the forecast period. Easy availability of erectile dysfunction drugs at retail pharmacies, low price of the drugs, and expansion of leading retail pharmaceutical chains across the globe drive the segment. The hospital pharmacies segment held the second largest share of the global market. However, the segment is likely to gain market share by 2026. A percentage of erectile dysfunction sufferers who would not be prescribed any of the PDE5 inhibitors due to contraindications have contributed to the high market share of the hospital pharmacies segment in 2017. The online pharmacies segment is poised to expand at a high CAGR during the forecast period. The global erectile dysfunction drugs market in Asia Pacific and Middle East & Africa is expected to witness strong growth from 2018 to 2026. Economic prosperity of the region has led to increased disposable incomes and enhanced affordability of expensive branded formulations by the patient base suffering from erectile dysfunction. Moreover, increase in geriatric population and high incidence rates of cardiovascular diseases, diabetes mellitus, and hypercholesterolemia in the region has led to significant patient base seeking treatment for erectile dysfunction.